I often go to Camden town just for food, and to shop around the stores. Green tea cocktail bar is located at the stables market. I walk passed many times eyeing up the pictures of the green tea variations. Green tea lovers you are spoilt for choices here, for hot and cold drinks matcha cocktails, green tea sweets and drinking green matcha the traditional way from a bowl. Any ways I opted for Matcha green tea mango vanilla ice. 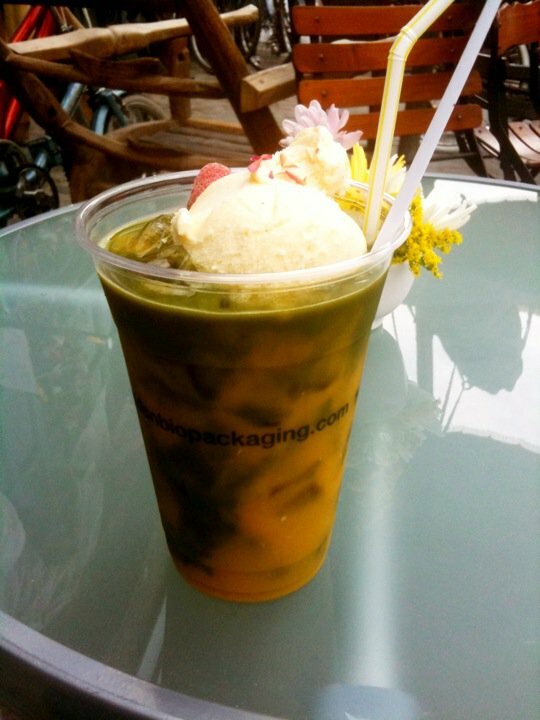 It was delicious and packed with flavour, fresh mango purée and green tea with a scoop of vanilla ice cream. I chatted to the lady about matcha tea and how to prepare it the proper way. I will be coming back for more! Thanks dear! Summer is back! Time to come back for your green tea cocktails! !